The live departures boards are amazing. I travel by train a lot, and I mean a lot, and the live departures boards make things enormously easier, seeing where I can gain time, will lose time, and planning stops for refreshments. I use the live departures boards all the time, and there's something that I'm finding odd. Consider the board shown at right. The first train marked there is the incoming train that will form the second service indicated. As you can see, it as due in at 11:57, and then out again at 12:01. But wait! The incoming service is (well, was) running late, not due to arrive until 12:03, fully two minutes after the outgoing service is (well, was) due to leave. And yet that second service is shown as still being "On time". Clearly they are expecting that the late running incoming service will, in the next two minutes (the screen was captured at 11:55) catch up some 4 minutes to enable it to then leave on time. You have to admire their optimism. So that leads me to my question. 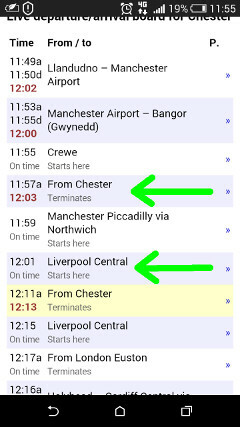 If the live departures board is updated automatically, why is that second service still shown as leaving "On time"? But if it's not updated automatically, it must be updated "by hand," and that just seems insane. So what is it? How can this be? Perhaps this is a definition of "On time" with which I was not previously acquainted.